Here stood the home of John Walker, Junior, known as “Chief Jack”. A grandson of Nancy Ward, he was prominent in the affairs of the Cherokee nation, belonging to the party advocating a voluntary treaty of removal of the Cherokees to the West. His murder by James Foreman in 1834 resulted in one of the most famous criminal trials of early Tennessee history. He married Emily Meigs, granddaughter of Return Jonathan Meigs. He is buried here. Location. 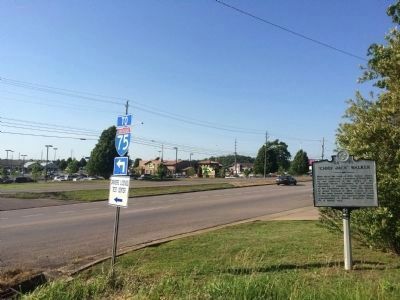 35° 11.994′ N, 84° 50.79′ W. Marker is in Cleveland, Tennessee, in Bradley County. 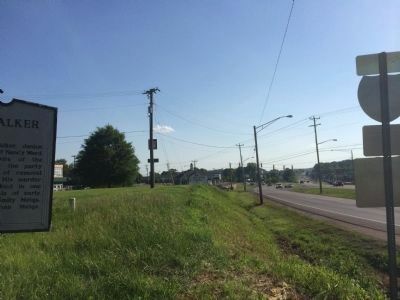 Marker is at the intersection of Keith Street Northwest (U.S. 11) and Stuart Road, on the right when traveling north on Keith Street Northwest. Touch for map. Marker is at or near this postal address: 4345 Keith Street NW, Cleveland TN 37312, United States of America. Touch for directions. (approx. 3.1 miles away); Col. Benjamin Cleveland (approx. 3.2 miles away); Cleveland During the Civil War (approx. 3.3 miles away); Fort Hill Cemetery (approx. 3.7 miles away); Cooper Cemetery (approx. 4.4 miles away); Charleston on the Hiwassee (approx. 7.6 miles away); The Henegar House (approx. 7.9 miles away). Touch for a list and map of all markers in Cleveland. More. 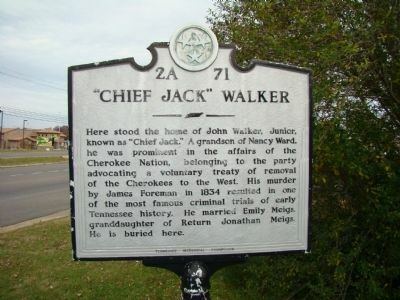 Search the internet for "Chief Jack" Walker. Credits. This page was last revised on June 16, 2016. This page originally submitted on December 5, 2011, by Judith Barber of Marietta, Georgia. This page has been viewed 1,201 times since then and 10 times this year. Last updated on March 12, 2015, by J. Makali Bruton of Querétaro, Mexico. Photos: 1. submitted on December 5, 2011, by Judith Barber of Marietta, Georgia. 2, 3. submitted on May 21, 2014, by Mark Hilton of Montgomery, Alabama. • Bill Pfingsten was the editor who published this page.